I realised yesterday that it passed more than two months since I got the results of my food intolerance test. These two months passed learning how to eat in a different way. New ingredients, new recipes (from which a lot were failures), ups and downs and now I can surely say that I feel much better in all aspects. But I have to admit that there are a few dishes that I miss really badly. Burek is the first on the list. 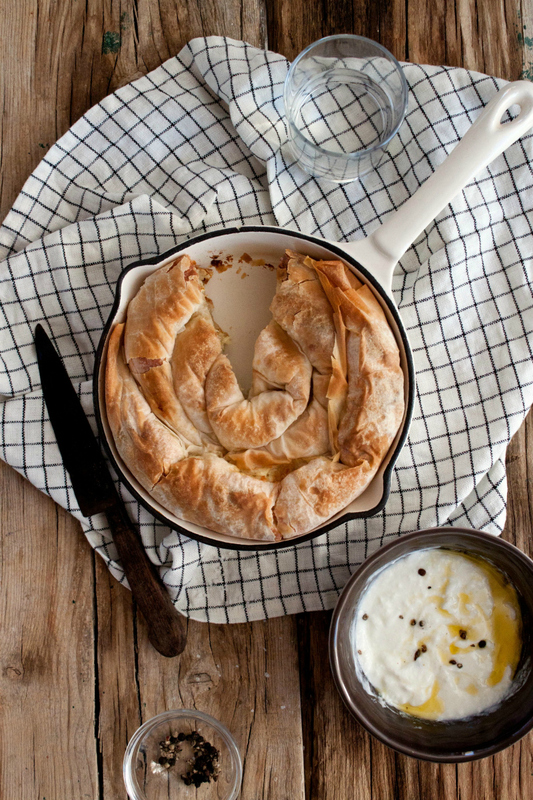 It's a typical dish that we eat back home, made with filo pastry. Since I never learned how to make filo pastry and I can't eat the wheat version that you can find in supermarkets... I just don't eat it. Percebi ontem que passaram mais de dois meses desde que recebi os resultados do meu teste de intolerância alimentar. Estes dois meses passaram a aprender a comer de forma diferente. Novos ingredientes, novas receitas (das quais muitas falharam), altos e baixos e agora posso com toda a certeza dizer que me sinto muito melhor em todos os aspectos. Mas tenho de admitir que há alguns pratos que eu sinto tanta falta. Burek é o primeiro da lista. É um prato típico que nós comemos na minha terra natal, feito com massa filo. Como nunca aprendi a fazer massa filo e não posso comer a versão de trigo que se pode encontrar nos supermercados... simplesmente não o como. Break the feta cheese with a fork. Add cottage cheese and mix. Add the cream and eggs and mix again until everything is incorporated. Brush the dish that you will use to place burek, with oil. Take one sheet of filo pastry, brush with sunflower oil and place other sheet on top of it. Place a few spoons of cheese filling on the top of the filo sheet (on the longer side), leaving 2cm edges empty. Roll pastry and place in a dish (if you use a round dish go from the edge to the centre). Continue until you finish all filling and pastry. Brush burek with oil. In a meantime heat the oven to 180ºC. Place the burek in the oven and cook around 40min (or until it gets a nice colour). If you see that it is starting to get burned, place an aluminium foil on top of it. Eat it hot with some yogurt. Parta o queijo feta com um garfo. Adicione o queijo cottage e misture. Adicione as natas azedas e os ovos e misture novamente até que tudo esteja incorporado. Pincele o prato que vai usar para colocar burek, com óleo. Pegue numa folha de massa filo, pincele com óleo de girassol e coloque outra folha por cima. Coloque algumas colheres do recheio de queijo por cima da folha filo (no lado mais comprido), deixando 2cm vazios nas arestas. Enrole a massa e coloque num prato (se usar um prato redondo ir da borda para o centro). Continue até terminar todo o recheio e massa. Pincelar o burek com óleo. Entretanto aqueça o forno a 180ºC. Coloque o burek no forno e coza durante aproximadamente 40min (ou até que fique com uma cor agradável). Se vir que está a começar a queimar, ponha uma folha de alumínio por cima. Coma quente com um pouco de iogurte. My daughter has many food allergies and intolerances and at first it is so overwhelming. I am glad that you have made it through the first two months. One cookbook we love and use a lot to fix really special treats for her is "Babycakes." There are two cookbooks full of yummy treats. It is gluten free, so would be good on your wheat free diet. If you ever make it to New York, they have a darling bakery there. My problem is not gluten..but the only flour I can eat is spelt and kamut. Will have a look at the book,thanks!! I love burek too, with just a little bit of yogurt. I truly hope your mum will manage to do spelt flour burek for you, actually I am sure she will :). Lovely post and photos, as usual :). Dobro da postoje naše mame..
Adoro burek. gosto muito do de espinafres do 100 Maneiras e tenho sempre vontade de experimentar em casa, mas nunca acontece.